In Oracle HRMS, you set up each physical site where your employees work as a separate location. Similarly, you enter the addresses of external organizations that you want to maintain in your system, such as employment agencies, tax authorities, and insurance or benefits carriers. When setting up internal or external organizations, you pick from a list of these locations. Locations are shared across Business Groups in Oracle HRMS and with two other Oracle applications: Inventory and Purchasing. 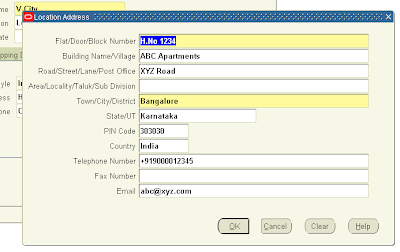 Oracle HRMS does not use some of the fields in the Location window. These fields are disabled for HRMS users. 1. Enter the name of the location, and a description if required. 2. Select a national address style from the list. 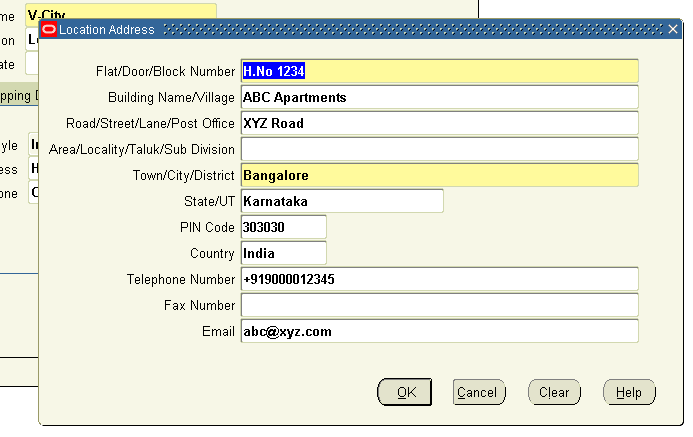 A window opens with the address format for the country you select. 3. Enter address information in this window and choose the OK button. Additional Information: Default address styles are predefined for many countries. You can add address styles for other countries, if required. Locations once created, canot be deleted. But in need, it can be done Inactive mentioning the inactive date. 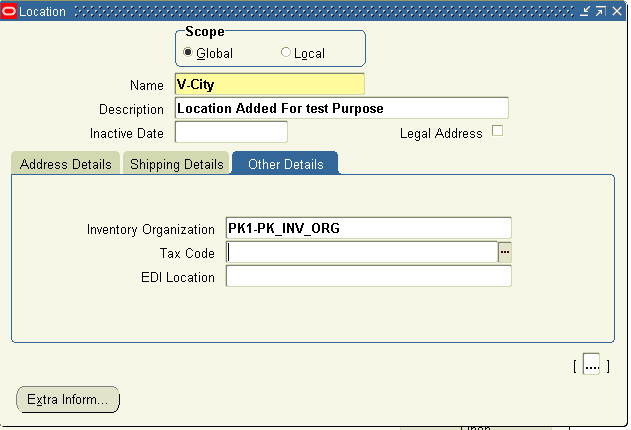 Uncheck the Global check box if you want the location to only be available within the default Business Group of your current responsibility. Accept the default if you want the location to be a global location and therefore available to all Business Groups. If you are setting up a global location, the location name must be unique across all Business Groups. If you are setting up a location for one Business Group, the location name must be unique within that Business Group and all global locations, but does not have to be unique across all Business Groups. Note: You cannot amend the Global check box once you have set up your location. Select a national address style from the list. If a local address style exists for your country, it is displayed as the default. Otherwise, the international style is displayed. 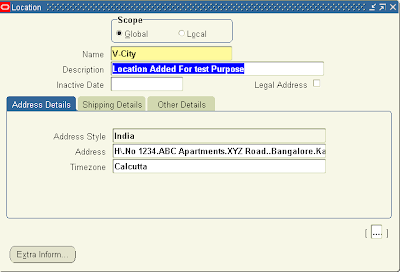 Selecting the check boxes means that you are making the location Name a valid location in the list of values on a Purchasing document. 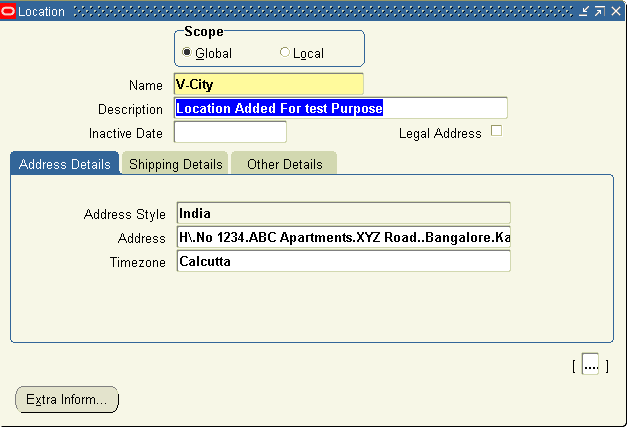 For example, selecting Ship–To Site makes the location name a valid choice in the list of values for the Ship–To field on a purchase order header. Note that if you define a default Ship–To or Bill–To Location in the Supplier–Purchasing region of the Financials Options window for your organization, which is the location that defaults onto your purchase orders. But if you wanted to change that default, the location name that you define here and enable as a Ship–To or Bill–To site is available in the list of values for you to choose from in the Ship–To or Bill–To fields. Contact: Optional contact name for the location Name. Ship–To Location: It’s the receiving dock. Usually the same as the location name. You could select a separate, previously defined Ship–To Location—for example, if you wanted to create a location Name, Office A, and specify Receiving Dock A as its Ship–To Location. Note, however, that once you specify a separate Ship–To Location, you can no longer enable the location Name as a Ship–To Site. In this example, Receiving Dock A is the ship–to site for Office A; therefore, Office A itself cannot also be the ship–to site. Ship–To Site: Is this location is a receiving dock. 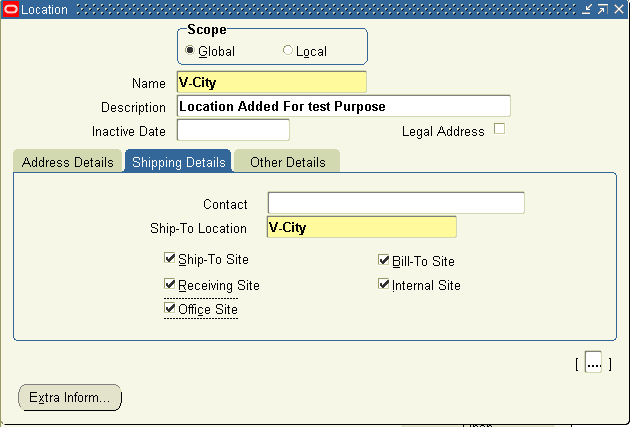 Select this option to make the location Name a valid ship–to organization on a purchase order or requisition. Bill–To Site: Select this option to make the location Name a valid bill–to site. The Bill–To Site, which is used by Payables, is specified on a purchase order header. Receiving Site: Select this option to make the location a valid receiving Location when creating a receipt or receiving transaction. Office Site: Select this option to indicate that this location Name is an office site, such as a field office. 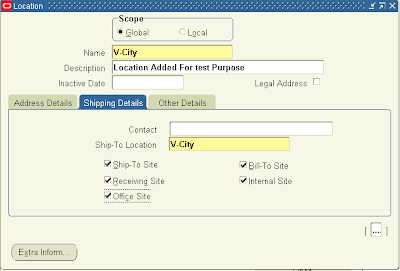 Internal Site: Select this option to make the location a valid internal ship–to location when creating an internal requisition. Inventory Organization: Select an inventory organization within which this location will be available in the list of values on a Purchasing document. 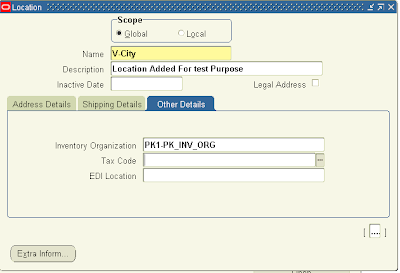 By selecting no inventory organization, this location becomes available on purchasing documents in all organizations. EDI Location: If you use Electronic Data Interchange (EDI) to receive Advance Shipment Notices (ASNs) or ASNs with billing information (ASBNs), enter a defined location. This location should match the ship-to location specified on an ASN or ASBN. how to add new country name which is not there in the list. ?